Tina Brown about Whitney Houston: "We did crack together"
Tina Brown, Whitney Houston’ sister in law and Bobby Brown’ sister, gave an ample interview to National Enquirer and explained how the late singer’s career spiraled out of control. Whitney Houston spent days locked in her bedroom amid piles of garbage smoking crack, her sister in law remembered. When Whitney Houston got high, she imagined the devil was beating her, but she was actually punching herself black and blue with her own fists. And the star’s beautiful singing voice, ravaged by drugs, was gone. “I did crack with Whitney,” said Tina Brown, a recovering addict herself. Tina Brown’s heartbreaking memories of Whitney Houston, who once had the world in her hands, are one shocking revelation after another. There were the days that Whitney Houston disappeared to languish in dangerous drug dens. There was the failed attempt at an intervention by her family when a cursing Whitney Houston nearly leaped from a second-story window trying to escape. There were the drug-induced delusions Whitney Houston had of hidden surveillance cameras watching her every move. Tina Brown’s drug partner days with Whitney Houston occurred when the star and Bobby Brown lived in the posh Country Club of the South in Alpharetta, Georgia, and she remembers the day she and her sister-in-law first got high. “We were drinking a lot,” said Tina Brown. Whitney Houston suggested they call dealers. “Call them,” Tina Brown recalls. What followed was a re¬lationship forged by drugs. Although Tina Brown had known Whitney Houston since her marriage to her brother in 1992, she’d never gotten close to her until that day. “Hey, I was using and she was paying. It was free,” said Tina Brown. That first drug binge went on for roughly 24 days in Whitney Houston’s home. Bobby Brown, no stranger to drugs himself, was serving 60 days in jail at the time for a probation violation on a drunk-driving conviction. Dealers came and went, delivering marijuana, powder cocaine and crack. And it was during this time that Tina Brown started to realize what drugs had done to Whitney Houston. “She saw demons when she got high,” recalls Tina Brown. One day a stoned Whitney Houston called Tina Brown over to a sink. “A dish had broken and in the cracks of the plate, she saw a pair of smiling lips,” said Tina Brown. When Whitney Houston got high, she would imagine concealed wires and spy cameras were everywhere. “She would get a screwdriver and take things apart to find the cameras,” said Tina Brown. In mid-March, Whitney’s mother Cissy Houston, who’d attempted many times to free her daughter from the grip of drugs, knew it was time to try again. When Cissy Houston and other family members arrived at the home, Tina Brown was sweeping the foyer while Whitney was in her upstairs bedroom, getting high. Tina Brown tried to close the door. She yelled up to Whitney Houston, using the singer’s shortened nickname, Nip. “Don’t let them in,” Whitney Houston screamed. 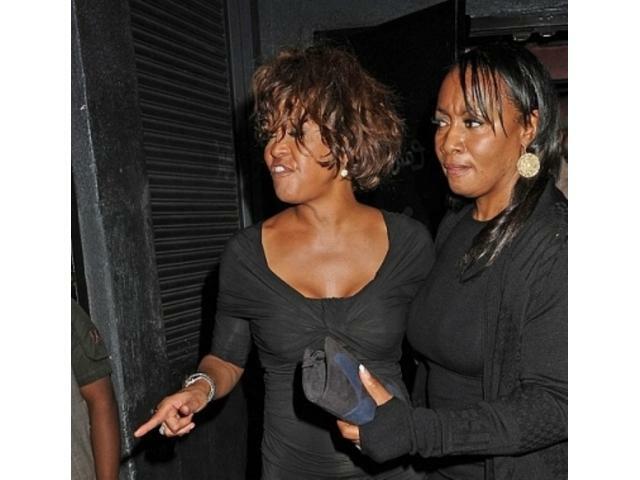 Tina Brown said Cissy Houston gave Whitney an ultimatum. Get into rehab or she was going to take her daughter Bobbi Kristina away from her or have her locked up. Bobby Brown’ sister could hear Whitney Houston cursing at her mother as security gathered up Bobbi Kristina and put her in a car. Tina Brown got into another. They were to be taken to a nearby hotel. That’s when all hell broke loose as a stoned-out Whitney Houston made a desperate bid to escape the intervention. “Whitney tried to jump out the window, her bedroom window on the second floor,” said Tina Brown. “She has her white bag and one of her legs over the window. “She’s screaming: <<Tina, don’t you leave me. Catch my bag>>. The whole intervention team checked into rooms for the night and promised to regroup in the morning. Whitney Houston and Tina Brown were in one suite together. They got high all day long. Before they fell off to sleep, the two were laughing so hard about Whitney Houston’s antics, the singer peed herself. Tina Brown said that one of her older children is handicapped and uses pull-up diapers. She had a pair in her purse. Whitney Houston found them and put them on. That’s when the laughter stopped. Tina Brown saw something that frightened her to the bone – black and blue bruises up and down Whitney Houston’s legs. Whitney Houston’s answer frightened Tina Brown even more. In the morning, Whitney Houston’s relatives saw the bruises too. At the end of that bizarre intervention, Whitney Houston reluctantly agreed to go into outpatient rehab at a center in Smyrna, Georgia, but only if Tina Brown went with her. Whit¬ney Houston would smoke crack before the sessions. Tina Brown ultimately moved into Whitney Houston’s house, acting in a sort of maid’s capacity after Bobby Brown got out of jail. The drug deliveries continued. Whitney Houston would purchase eight balls of crack, pieces of rock cocaine weighing an eighth of an ounce each. She’d cut open a cigar, take the tobacco out, put in marijuana and the whole piece of crack and puff away. In June 2004, Tina Brown was sent to prison for a year for possession of drug paraphernalia and violation of probation. She has a record of arrests for drug offenses. It was a blessing, Tina Brown says, to be away from Whitney Houston and the nonstop drug use. Bobby Brown was worried Tina Brown may have been Whitney Houston’s drug partner but at least she was able to keep the singer at home when she binged on drugs. With Tina Brown in jail, Whitney Houston started to disappear for days at a time, sometimes doing drugs with friends, but other times visiting crack houses in dangerous areas of Atlanta. From jail, Tina Brown remembers calling her mom Carole Brown. Her mother was weeping. Tina Brown learned Whitney Houston had been in the drug den for days giving orders to dealers and drug buyers, telling some to leave, telling others where to sit, seeing demons, thinking she was under surveillance. It became too much for the dealer. “Bobby and security had to go get her,” said Tina Brown. When Tina Brown was released from prison on June 3, 2005, she was drug-free but that ended July 5, the first time she went over to Whitney Houston’s house. “I started again. She needed some help in the house and that was it,” Tina Brown recalled. At that time, Whitney Houston was actually getting ready to cut a single with record producer Jermaine Dupri. It would be the first time she’d entered a studio in years, said Tina Brown. But Whitney Houston’s beautiful singing voice, the one that sold more than 100 million albums, the one that hit those impossible-to-imagine high notes, was gone. “It’s horrible. She couldn’t sing anymore,” said Tina Brown. Still, Tina Brown did her best to get Whitney Houston ready for her studio session. “She had a machine to get her voice in shape. I’d hook it up and put this liquid in this holder and this breathing device in her mouth. It’s like steam and she had to do these treatments for an hour, three times a day. But she kept doing it just once. Tina Brown’s relationship with Whitney Houston eventually ended. She kept up her own battle to become drug-free and prayed for a Whitney Houston comeback, a day when she’d reach the top once again, but it didn’t happen. did bobby brown's sister leak it to the national enquirer? how many cars did whitney houston had?